Baby Sak’s versatile diaper bags feature neutral colors and a grown-up design that’s so convincing, you wouldn’t know it’s a diaper bag. (Which is exactly the point.) The multi-functional bags can be worn on your shoulder, cross-body, or as a backpack. Each is lightweight and durable with plenty of space for diapers, wipes and more—plus there’s an insulated bottle holder and a fold-out changing pad to make on-the-go diaper duty easier. Dimensions: 9" x 5.5" x 17"
I have given this to several friends as a baby or shower gift. They all seemed to love it. It certainly has everything. New dads love this and moms do too! I have bought this for 2 of my children and they both love it!! So many pockets and great for mom or dad to carry!! I bought two of these...for two different Mom's to be! Both of the Moms...along with the daddy's ...can't say enough on how pleased they are. Thisy are. 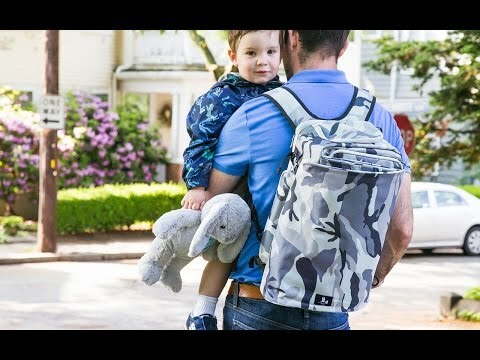 This is finally a gift the daddy's can also appreciate..as the diaper bags today are all designer and look like lovely handbags..this still is more than appropriate to the male carrier...and especially with the backpack! 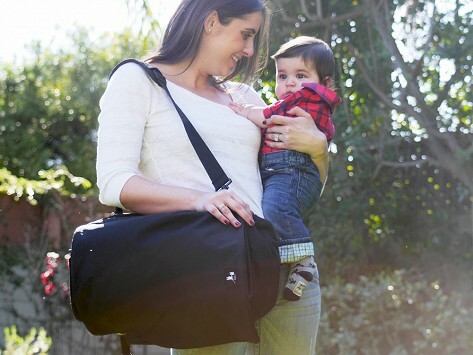 Any weighed-down parent will tell you a versatile diaper bag can make an outing with a baby much more doable. (So. Much. Stuff.) Baby Sak bags are made for those parents who appreciate an organized, smart design—but want a bag that does diaper duty discreetly. The multi-functional diaper bags look like a messenger bag or backpack—and easily converts to be worn either way. The neutral colors help keep them disguised, too. The interior, however, is another story. It is baby gear heaven, with space for up to 10 diapers, wipes, clothes, toys . . . there’s even an insulated bottle holder. Dad Daniel Meyers created these bags after having his own kids. He wanted to make it easier to change diapers on the go, so his bags have a built-in changing pad. And the whole bag can be wiped down, because, as any parent knows, an accident is inevitable. Whether it’s on your shoulder or on your back, this lightweight, durable bag does the job of a diaper bag—and then some.